Simsbury Troop 175 Welcomes Five New Eagle Scouts. 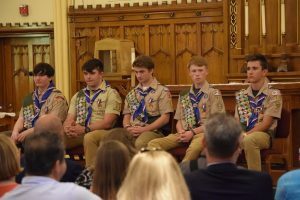 At a ceremony held at St. Mary’s Church in June, The Boy Scouts of America Troop 175 held a National Eagle Scout Court of Honor to welcome the troop’s five newest Eagle Scouts. Eagle Scout is the highest rank attainable in the Scouts of America. Requirements include earning at least 21 merit badges and demonstrating Scout Spirit through the living Boy Scout Oath and Law, community service, and leadership. This includes an extensive service project that the Scout plans, organizes, leads, and manages. Eagle Scouts are presented with a medal and a badge that visibly recognizes the accomplishments of the Scout. 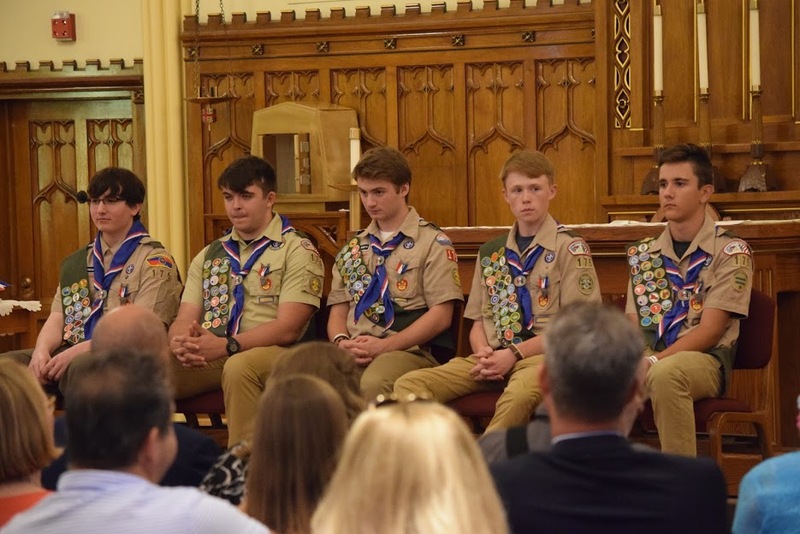 The scouts earning this recognition were Timothy T. Houghton, Lucas Watson, Andrew Bessette, Charles J. Brinegar and Luke Doskos.